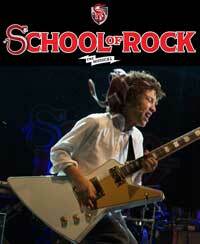 MORE: Check out our interview with School of Rock‘s guitarist, Brandon Niederauer! 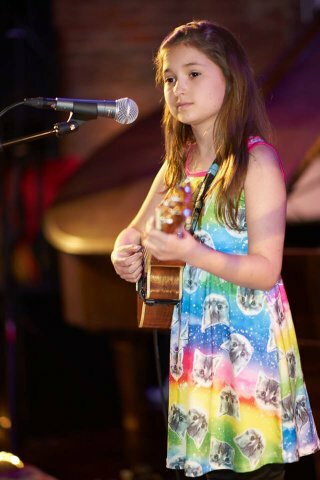 Not yet twelve years old, Evie Dolan is already a triple threat — she’s singing, acting and dancing in Broadway’s smash hit School of Rock – The Musical, Andrew Lloyd Webber’s stage adaptation of the 2003 Jack Black film. Dolan’s audition landed her the role of “Katie,” the cellist-turned-bassist who learns to “stick it to the man” at the urging of unlikely substitute teacher Dewey Finn (Alex Brightman, in a star-making performance). After originating the role of Katie in School of Rock‘s summer 2015 off-Broadway run, Dolan made her Broadway debut at the Winter Garden in December. 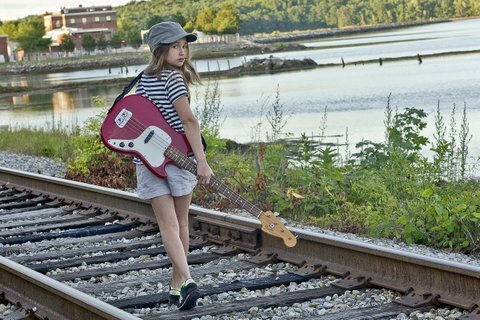 The young star took time out from rocking eight shows a week to talk to zZounds about her growing gear collection, her favorite song and scene in the show, and what she hopes audiences will learn at School this year. 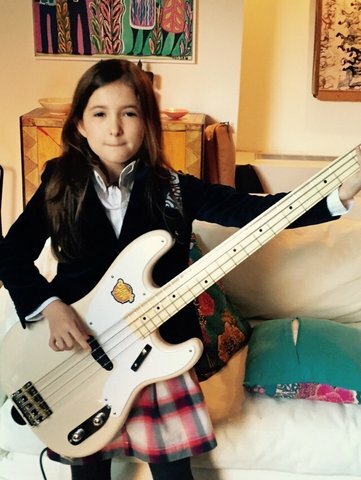 Getting into character: Evie picked up the bass for her School of Rock callback audition. zZounds: Evie, is it true that you’d really never picked up the bass before your School of Rock audition? Tell me about the audition process…were you nervous? Evie Dolan: Yes, it’s true! For my first audition for School of Rock last January, I came in with my Mitchell electric ukulele and my mini Taylor guitar. I played Katy Perry’s “Hot n Cold” on my ukulele and I really wasn’t nervous. Everyone there was very friendly, and it was a lot of fun. Then — I remember it was a Friday afternoon — my mom got an email saying that they’d like me to come back again on Monday, and this time, bring my bass. We didn’t have a bass, and I had never touched a bass before. We thought it might be a mistake, but then we called my dad and he thought that it was a good excuse to buy one! So he stopped at a music store on his way home from work and bought a full-scale Fender Squier. That bass was really huge and heavy, but I had no idea that there were smaller ones. My dad helped me figure out my first song, which was “Another One Bites the Dust” by Queen. It has a pretty simple and cool bass line, and as soon as I got the hang of it, I started loving the bass. Then on Sunday, I went to an amazing teacher named Dan Kleederman with the sheet music for “Teacher’s Pet” from the show, which is what I was supposed to play at the callback. I remember he thought I picked it up really fast. I was all ready to go in on Monday, but then, I guess it was kind of lucky that there was a blizzard that day and the auditions got postponed for a couple of days, so I had a little more time to practice. When I went in to the studio in Chelsea for my callback with my new bass, I told the creative team that I had learned it. I remember that someone said to me, “Great, you learned the song?” and I said, “No, I learned the bass!” and they all laughed. 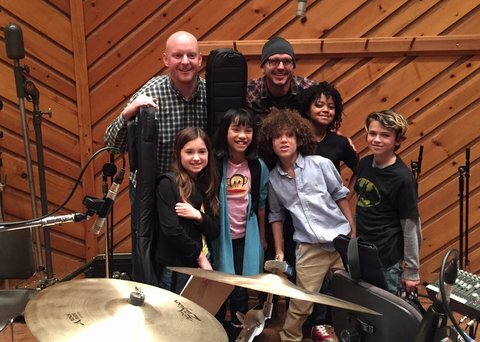 School of Rock’s director, Laurence Connor, reminded me later that he said “Evie, do you think you’ll be able to play the bass?” and I said, “Sure, it’s only four strings.” And then I played “Teacher’s Pet” for them. Old school: Evie’s vintage Fender Musicmaster bass. zZ: On your website, I saw a cool photo of you with a short-scale Fender Musicmaster bass — an instrument you don’t see every day. These days, Fender makes the Squier Bronco bass, but the one in the photo is a vintage instrument. What’s the story behind that Musicmaster bass? 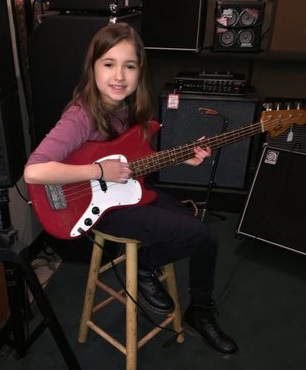 Evie Dolan: Well, after I found out I got the part for Katie the bass player in the off-Broadway workshop for School of Rock, we realized I needed a smaller bass. We went to Matt Umanov, the famous guitar store in the West Village, and they had this beautiful red 1975 Fender Musicmaster on display. I think they were a little skeptical that I could even play it, but they let me try it out and it was awesome. It fit me perfectly and was so easy to play and sounded amazing. My grandparents bought it for me as a special congratulatory present, and I love it so much. We decided to retire the Fender Squier that I used for the audition because it was so huge, and on the closing night of the Gramercy Theater run of School of Rock, I got everyone in the cast to autograph it for me, including Andrew Lloyd Webber! 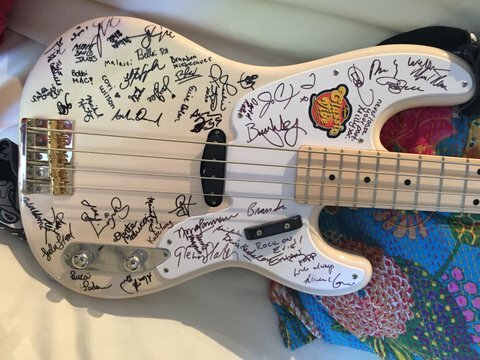 Evie Dolan’s Squier Classic Vibe ’50s Precision Bass — signed by her School-mates. 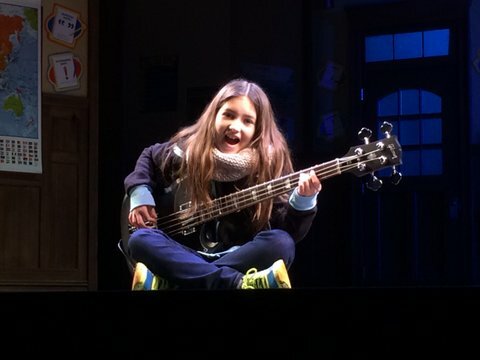 zZ: On stage in School of Rock, it almost looks like your bass is taller than you! How does it feel to play bass when you’re used to ukulele? Evie Dolan: It was a big change from my ukulele! I’m only 53 inches tall, so it is pretty big and heavy for me. The ukulele is so light and the frets are much closer to each other and the strings are thinner, so with little hands it was a great instrument for me to start on, and I still love it because I can easily take it anywhere. With the bass, you kind of need to have at least one other person around to play with, it’s heavy to carry around, and you need an amp — so it’s a little more complicated. But it’s worth it. 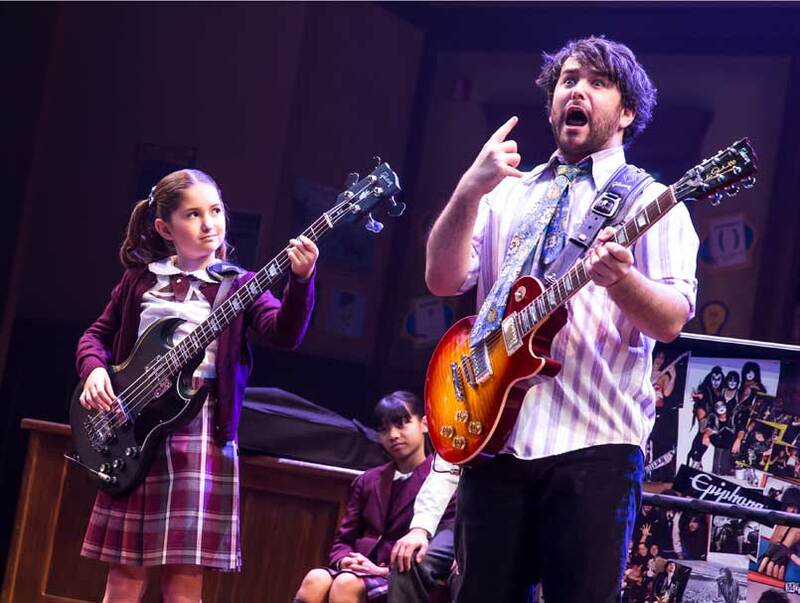 Evie with the Gibson SG Standard Bass she rocks in School of Rock – The Musical. zZ: Tell me about the Gibson bass that you play in the Broadway show. Evie Dolan: I played an Epiphone EB3 bass on the Gibson float in the Macy’s Thanksgiving Day Parade, but the bass I play in the show is a Gibson USA SG Standard Bass in a 30.5″ scale in a custom matte black. I love the Gibson SG bass; it is an awesome instrument. It sounds great and looks super cool. The bass adds so much to almost any song, because it holds the rhythm as well as playing melody or harmony, and it has such a cool deep sound. I took some lessons over the summer with a great bassist named Debbie Duke, and she helped me understand how important the bass is in a piece of music and that it’s really cool to be a female bass player. The bass adds so much to almost any song, because it holds the rhythm as well as playing melody or harmony, and it has such a cool deep sound. Traditionally, there haven’t been too many female bassists, but I’ve met a few girls who have come to the show who are learning bass, which is awesome. Evie Dolan: You are right! I now have a Lanikai acoustic ukulele, a Mitchell electric ukulele, a mini Taylor acoustic guitar, a full-scale Fender Squier bass, the 3/4-scale vintage 1975 Fender Musicmaster, a Gretsch New Yorker mandolin, and a Dean banjitar. I rented the saxophone I played at school last year, but I’d love to own one someday. We also have a Yamaha Arius keyboard with 88 weighted keys, which is awesome for apartment living. My dad also has a bunch of other guitars that I play around with, including a 1975 Fender Stratocaster electric guitar and a Seagull Maritime SWS acoustic guitar. I also keep a Fender Mustang bass at my grandparents in Miami, so I can practice when I visit them. zZ: Any cool amplifiers or effects pedals in your collection? Evie Dolan: I don’t have a good bass amp yet — I am still using the Fender Acoustasonic 15 amp that we bought for my electric uke, which is definitely not made for a bass — I always hope I don’t blow it out. And I don’t have any effects pedals yet. But my birthday is coming up and I have a bass amp and some pedals on my wish list. zZ: Who are your favorite musical artists? If you could collaborate with any artist or band, who would it be? Evie Dolan: My fantasy would be to collaborate with Stevie Nicks or Ingrid Michaelson. I have lots of other favorites — a few are Katy Perry, the Magnetic Fields, the Beatles and Lenka. And Carole Kaye is my favorite bass player and an inspiration. Beginner bassist? Check out zZounds’ Bass Beginner’s GuidezZ: I saw your Instagram photo with Ingrid Michaelson. I hear that Stevie Nicks came to the show, too! Evie Dolan: I couldn’t believe it — my two favorite musicians both came to School of Rock on opening night, and I actually got to meet both of them! I met Stevie Nicks at the opening night party at the Hard Rock Café, which blew my mind. She was so encouraging and nice; she spent a long time talking to me and our drummer, Dante Melucci. She even told me that she would love for me to play with her band sometime! I knew Ingrid Michaelson came to the premiere, but she didn’t make it to the party so I didn’t get to meet her that night. But then, she sent a message over the next day inviting me to be her guest at her Webster Hall Holiday Hop concert, which I’ve always wanted to go to. I got to meet her in her dressing room right after, and I practically died. She is the person who inspired me to start playing my ukulele, and I know almost all of her songs by heart. Both of them are idols of mine. zZ: Do you have a favorite musical number to perform in the show? Favorite scenes or lines? What’s the line that gets the biggest laughs/cheers? zZ: Speaking of “You’re In The Band,” I’m a big fan of the 360-degree video. I’m curious about how the video was made — were there a bunch of cameras in the middle of the room, or what? Evie Dolan: There were seven GoPro cameras hung from the ceiling facing all different directions, including up and down. We shot it one day at a school in Bay Ridge, Brooklyn, and we had a blast. We all were totally amazed when we saw it for the first time — one detail I love is that the chords and lyrics are on the ceiling! zZ: Tell me about what it’s like to work with Alex Brightman as “Dewey.” Is he as much fun in real life as he seems on stage? Evie Dolan: Yes, he is! I am so lucky to be able to work with him. Alex is so funny and fun and talented. He is constantly making me laugh. He is also always working on a ton of creative projects, and I can’t wait to see everything he is going to accomplish. zZ: What was it like to go in the studio for the Original Cast Recording? How is singing and playing on a recording session different from performing in the show? Evie Dolan: We recorded the album at the legendary Avatar Studios, where so many famous bands and musicians, including David Bowie, John Lennon, the Clash, the Kinks, and Madonna, have recorded — so it was super cool. It was a very different experience to record in the studio. For the singing parts, we all sang into microphones in groups and our timing had to be perfect. When we sing live, the band can adjust, but in the studio we played to a track, so you had to be exact. When we recorded our instruments, it actually felt kind of the same as playing live — you have to listen to each other either way — just one way is through the onstage speakers, and the other is through headphones. zZ: What “lesson” or message do you want other kids to take away from the show? Evie Dolan: My first introduction to being a musician was with the piano, and I honestly wasn’t too good. I didn’t like practicing, and it was always hard for me. Then, I saw someone play the ukulele, and I tried it and suddenly it was all so much fun and I loved practicing it all the time. So my message is to try and find an instrument that you love, and that will open the door to making all kinds of music. Don’t give up. 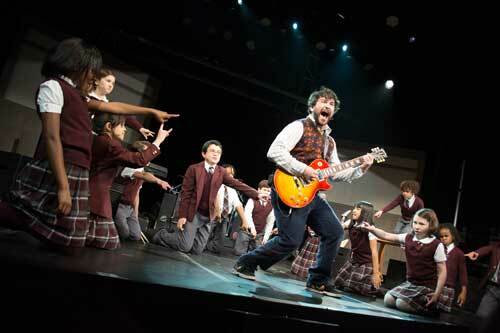 And I guess that’s pretty much the same story with the kids in School of Rock. Music is an amazing way to express yourself.